Everyone’s homes smell like banana bread and cookies and cinnamon rolls right now. Because it’s Christmas and winter and that’s what houses smell like this time of year. But how many houses smell like Banana Bread French Toast? Not enough as far as we’re concerned. Simply not enough. This year, let’s join forces. Let’s band together as one and change this culinary injustice. One and all, let’s turn that boring ‘ole log of banana nut bread in to one of the finest breakfast pastry indulgences yet seen. I’ve been making this for my husband for years. 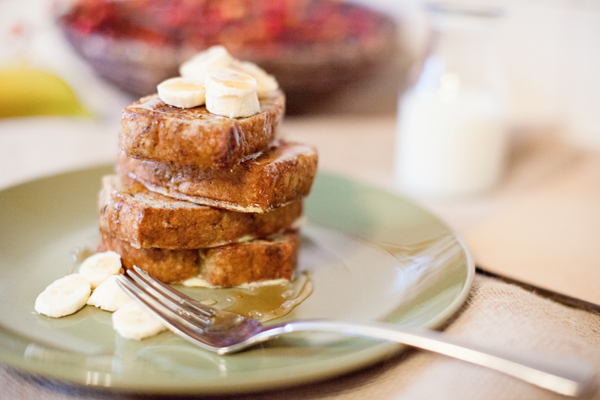 There’s no time that isn’t the right time for Banana Bread French Toast. But just like the old gnarly black bananas that make the banana bread even better, there’s something about letting a fresh loaf turn a bit crusty before drenching it in a sticky milk and egg bath (I spike mine with a generous pour of vanilla, too) before grilling that makes the best breakfast ever. How best ever? This is like weak-in-the-knees, moan-and-groan, beg-for-mercy kind of deliciousness that will consume you mind, body, and soul. Calm down, you say? This is not just some stale slice of white sandwich bread french toast. This is THE french toast that all other french toast standards should be set by. We start with our Healthier Flaxseed Banana Bread, but you should feel free to use your tried and true ‘nanner bread recipe. Just know that ours is betttttter for youuuuu! 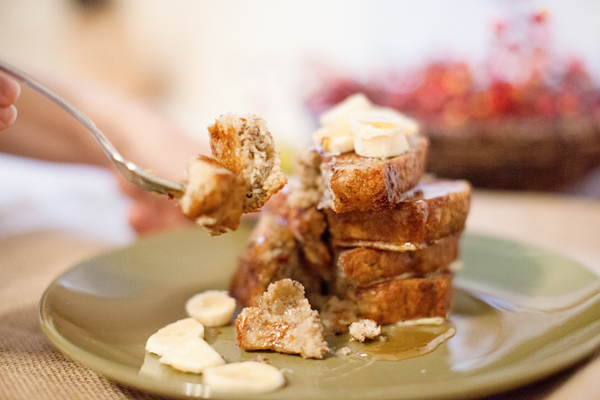 In fact, after the bread is baked, and then grilled in to french toast, a two-serving slice of our Banana Bread French Toast weighs in for 218 calories. It’s such a steal, especially when you consider how darn indulgent it is! You guys, one order of french toast at IHOP is 920 calories – and that’s before the honey, butter, bacon, and hashbrowns. If it didn’t sound so unappetizing, we could get away with calling this Calorie Bargain Basement French Toast. 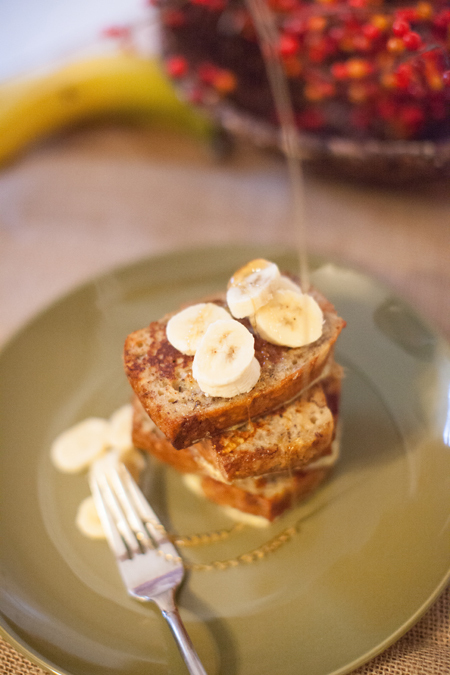 We continue to keep it trim by topping it with more fresh-sliced bananas and a generous drizzle of sweet local honey. Splurge a bit and add cream cheese. Or complement the flavor in an exceptional way with fresh raspberries, strawberries. Or go for broke and schmear the top with almond butter. Either way – cheers, happy breakfast, and enjoy from our kitchen to yours! 1 Tbsp. vanilla … whisk all of this together. 1. Prepare one loaf of banana bread. 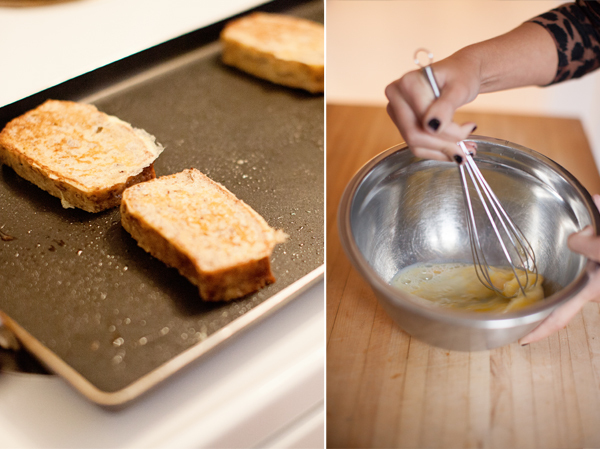 Can prepare french toast after cooling, but it’s best a day or two later. 2. Heat a griddle to medium-high heat and mist with cooking spray. Whisk together the eggs, milk, and vanilla. 3. Slice the bread in to 10 equal pieces, dip the bread in to the egg wash, then place on the hot griddle. 4. Serve immediately with your choice of toppings. 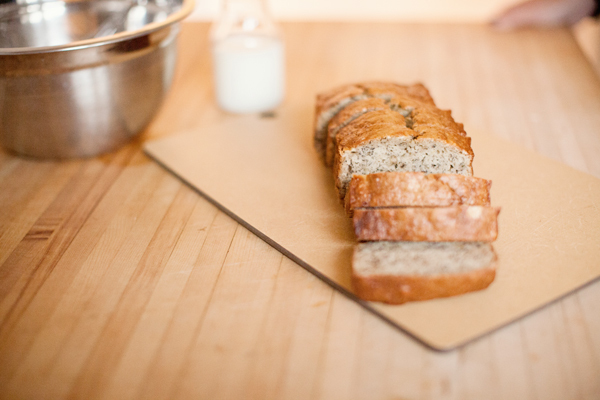 Recipe by Brandi Koskie; Photos by Kacy Meinecke. Special thanks to Brynnan Norris.